Get out of your culinary rut with help from sorghum, black rice and chickpea flour. Many people hear “sorghum” and think “sweetener.” While it’s true the stalks of sweet sorghum are crushed to produce syrup, grain sorghum produces nutritious BB pellet-like kernels that range in color from white to brown to bronze. This ancient grain traces its origins back about 8,000 years to Africa, but it’s popularity is growing in the U.S. It’s gluten-free and has a lower glycemic load than some grains, helping to contribute to healthy blood sugar levels and steady energy. Sorghum has a neutral, sometimes sweet flavor. That quality, along with its light color, makes sorghum flour suitable as a substitute for wheat flour in many baked goods, and the intact whole grains are ideal as a swap for other grains in a variety of dishes, including soups, salads, pilafs and grain bowls. You can even pop them like popcorn! 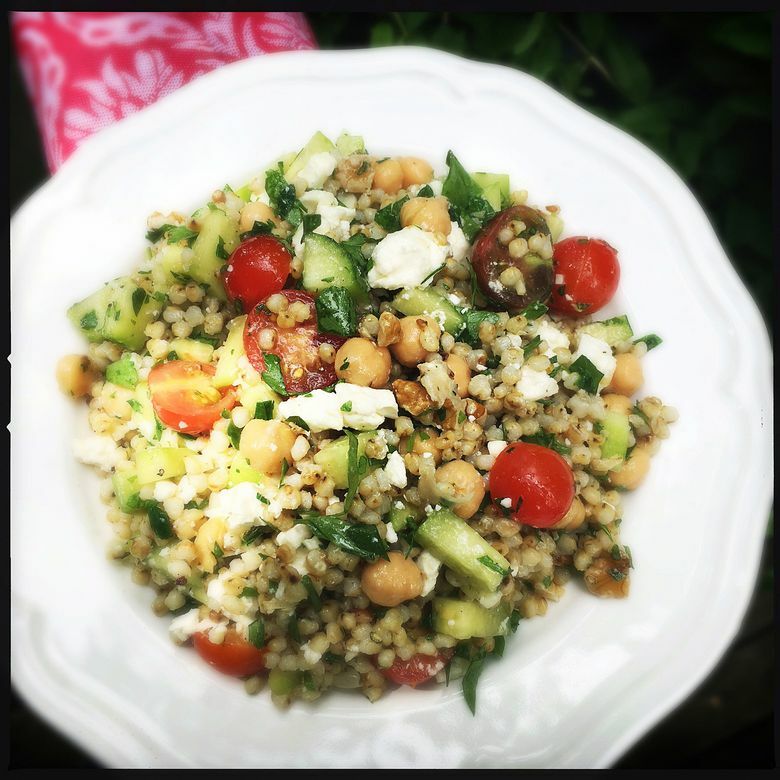 Whole-grain sorghum takes about 45 minutes to cook, using 4 cups liquid per cup of sorghum. Black rice, which sometimes carries the exotic-sounding names “forbidden rice” or “emperor’s rice” is a whole grain with extra benefits. Like brown rice, it has fiber- and antioxidant-rich bran. But black- rice bran is also rich in a class of phytonutrients called anthocyanins. Anthocyanins, purple and reddish pigments that have antioxidant properties, may help lower your risk of heart disease, cancer and age-related mental declines. 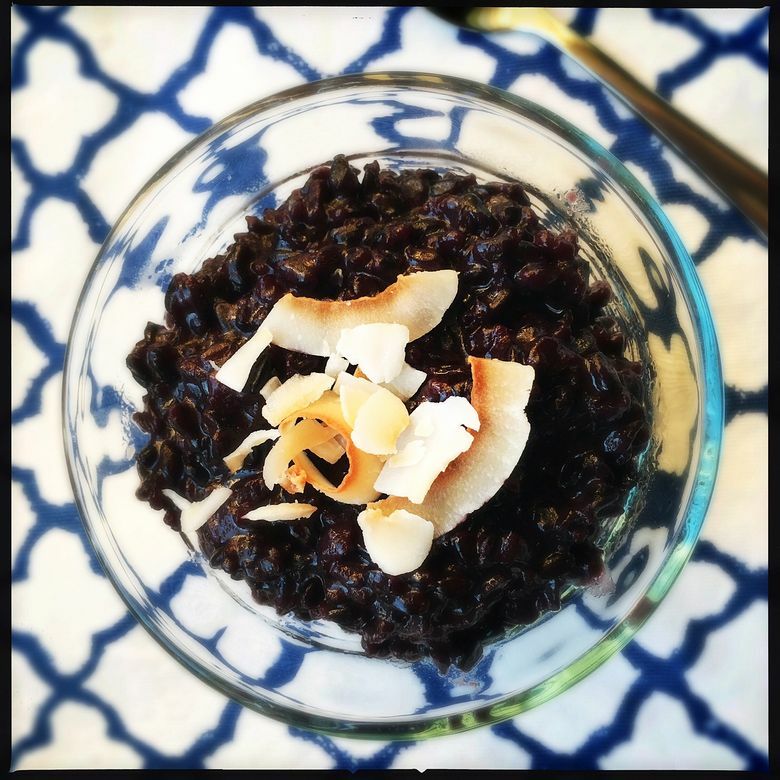 Black rice looks deep purple, rather than black, when cooked, which means it makes a beautiful rice pudding (see recipe) or a colorful side dish for chicken or pale fish dishes. When cooking it simply as a side dish, use 1 cup rice to 2 cups water, and simmer for 30 minutes or until done. Chickpeas (or garbanzo beans) are nothing new, as anyone who enjoys hummus knows. But this nutritious bean also makes nutritious, high-protein, gluten-free flour. It can replace all or part of the flour in many sweet and savory recipes and works as a thickener for soups and sauces. Even better, it’s far more inexpensive that some gluten-free flours — a 16-ounce bag from Bob’s Red Mill is less than $3. Curious? Check out the new cookbook “Chickpea Flour Does It All” by Lindsey Love for endless delicious ways to use this versatile bean flour. 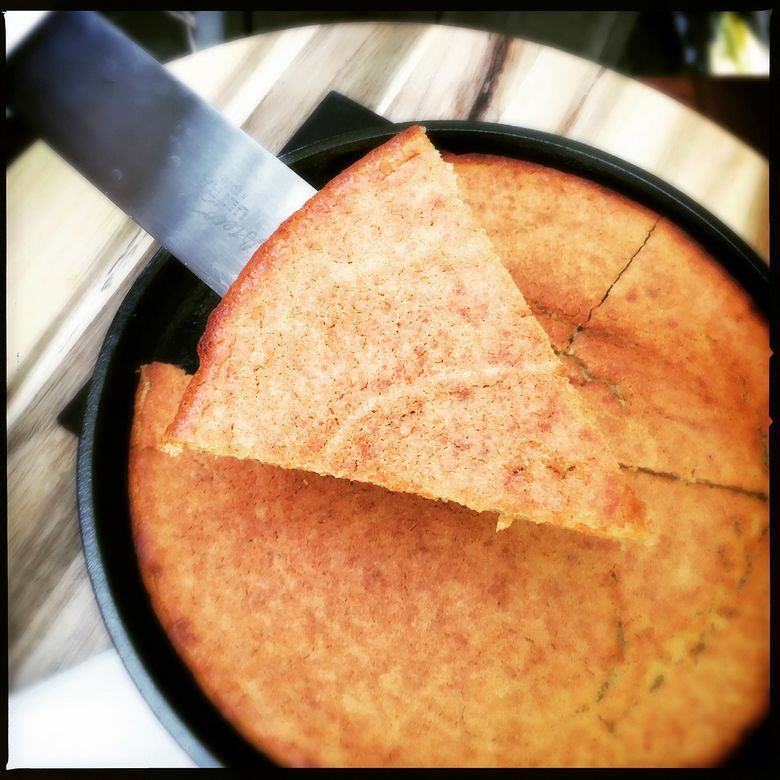 One of my favorite ways to use it is for socca, a chickpea pancake that is popular in southern France and Italy (where it’s called farinata). The traditional — and best — way to cook it is in a wood-fired oven, but you can easily make do with your home oven using a skillet or pizza pan. Combine dry ingredients in a mixing bowl and whisk to combine. Slowly add the water, whisking to break up any lumps. Add the 2 tablespoons olive oil and briefly whisk again. Cover and allow to sit undisturbed for at least 1 hour but up to 12 hours. Place one oven rack in the middle and another about 6 inches from the top. Place a cast-iron or other heavy 10- to 12-inch skillet or pizza pan in the oven and preheat to 450 degrees. Carefully remove the hot pan and add 1 tablespoon of oil, swirling to coat the bottom of the pan. Whisk the chickpea batter briefly, then pour it into the pan and put back in the oven. Bake for 8-10 minutes, or until it looks firm and the edges are set. Heat the broiler and brush the top of the socca with more olive oil, if desired. Set the pan on top rack and broil until the socca is browned in spots. Use a spatula to remove the socca from the pan, cut into wedges and serve hot! This simple recipe makes a lovely breakfast or dessert pudding. Use less sweetener if serving for breakfast, more if serving for dessert. Combine rice, water and coconut milk in a medium, heavy-bottomed saucepan. Bring to a boil over medium-high heat, then reduce heat to low, cover the pot, and simmer for 45 minutes, stirring occasionally. Add sweetener and salt and simmer, uncovered, stirring occasionally, for about 15 more minutes, or until the pudding is thick (with most of the liquid absorbed) and the rice is tender but still chewy. If the pudding seems too dry, add extra water, ¼ cup at a time, while it simmers. Remove from heat. Serve warm or at room temperature with desired toppings. This salad makes a flavorful side dish or stand-alone salad entrée. If serving as an entrée, serve over arugula or other greens. Leftovers pack well in a jar for a brown-bag lunch. I used Wondergrain [www.wondergrain.com/] whole-grain sorghum, but other brands will work, too. Rinse and drain the sorghum. Bring the water to boil in a medium saucepan, then add the sorghum. Cover, reduce heat and simmer for 45 minutes or until tender. Cool sorghum to room temperature, fluffing with a fork occasionally. Meanwhile, make the dressing and prep the rest of the ingredients. In a large bowl, combine the next four ingredients (chickpeas through green onions). Add the sorghum and gently stir to combine. Drizzle the dressing over the contents and stir again. Add the cherry tomatoes, fresh herbs and feta and gently fold to combine. Adjust salt and pepper to taste, and serve.